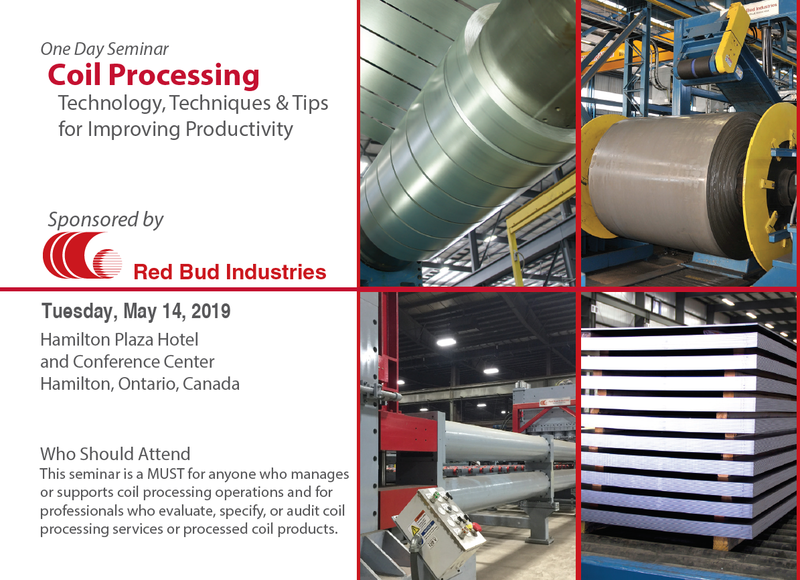 This comprehensive seminar is designed to deepen your coil processing knowledge and provide valuable insight into new technologies. Industry experts will present practical, real world strategies for improving the quality and productivity of your coil slitting, leveling, blanking, and cut-to-length operations. Q&A sessions further address issues of greatest interest to you, and the seminar book is a valuable reference you will use for years to come. Discounted room rate of $119.00 plus tax. For group rate, mention code “Red Bud Industries” when booking. Located halfway between Toronto and Niagara Falls, Hamilton is the third largest city in Ontario. Hamilton International Airport (YHM) is just ten kilometres from the Hamilton Plaza Hotel and Conference Center. Seminar fee is $169 US Dollars. An additional attendee receives a 50% discount with each full price attendee from the same company. Space is limited so register soon. By Mail: Red Bud Industries, Inc.